In the study, researchers examined information on more than 13,000 New Yorkers from all five of the city’s boroughs, who voluntarily had their height and weight measured. The data, collected at community-based health centers and hospitals using this this body fat analyzer between January 2000 and December 2002, was used to calculate each person’s BMI. For Hispanics, whether the neighborhood is largely English speaking or not is an important predictor of body size. The less English spoken in a neighborhood, the less weight gain occurs, according to researchers, whose findings appear in a recent issue of the International Journal of Behavioral Nutrition and Physical Activity. The new study supports earlier research that found that weight gain is most consistent and significant among Hispanic immigrants to the U.S., who face a particularly high risk of obesity and attendant health problems even when socioeconomic status is taken into consideration. The link to the study can be found here. I wish journalists would clearly cite the actual source of study because oftentimes it takes a while to search and find it and only the most interested users bother to go to the source of information. I can actually attest to this sparingly, since the study only seems to hold true among Hispanic immigrants and I am not. I gained about 40 pounds since I started residing in the United States without any changes to my height or level of physical activity. I have shed about 15 of those down to 115 in the past year after getting more health conscious, but the point is that Americans do consume foods with higher calories. And the more we “assimilate,” the more we tend to consume “American foods” on the go instead of ethnic, home-cooked meals which are generally and broadly-speaking, healthier. I don’t think the morale of the story is that we should hide out in our own ethnic enclaves–but that mirroring American consumerism and diet is the wrong way to go. That efforts by opponents of illegal immigration to stamp out the ethnic identity of immigrants and their descendents, and to emphasize assimilation, backfire… Nonimmigrant Mexican-Americans who were already largely assimilated feel a closer connection to their Mexican identity when they see it as under attack. “People who feel the country is fractured by ethnicity may be doing more than anyone to harden ethnic identity,” he said. The study holds up when compared to conflict theory. When a minority culture faces attack from the dominant culture, it resists or pushes back. While we are on the topic of assimilation and “illegal immigration,” is it not strange that the biggest proponents of assimilation are also the ones that prevent avenues for immigrant assimilation–Studies show that being undocumented is a barrier to assimilating. Therefore, if we want our immigrants to assimilate, should we not ensure that they have the necessary institutional support to do so? 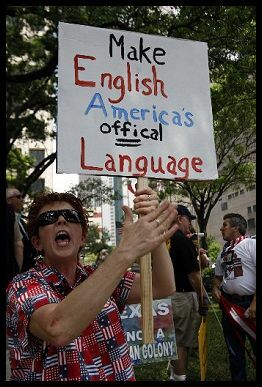 Otherwise, it is ridiculous to expect migrant workers to speak American-English. Lets learn to speak English first, eh? ← Previous Previous post: Immigration Buzzword – Reject "Assimilation"